After the financial crisis of 2007–2008, housing-market headwinds limited the economic mobility of many American homeowners, according to ATTOM Data Solutions, as per a new report from MarketWatch. Starting in 2009, the average tenure of homes sold in 3Q broke a critical neckline of resistance above 4-years and doubled to 8-years by the end of 2017. This analysis shows Americans are holding on to their homes for the most extended length of time ever. As the Trump administration continues to promote the "greatest economy ever," stagnation is building in the housing market, and it could get much worse in 2019. The average tenure of homes sold in 2018 jumped well above 8-years to 8.23 years in 3Q, which shows Americans are experiencing a rapid deterioration in their economic mobility to sell their home. ATTOM spokesman Daren Blomquist told MarketWatch that the long tail of the housing crisis had created stagnant conditions and contributed to a less dynamic housing market. Data from CoreLogic shows 2.2 million homeowners were still underwater on their mortgages in 2Q. Another 550,000 have 5% equity or less, which if they sold today, the homeowner would walk away with nothing. "The hypercompetitive market that’s emerged from the wreckage of the crisis is also keeping people in place. Many homeowners have ample equity in their homes, but hesitate to list those homes because they’re worried about finding a property to buy if they do sell," said MarketWatch. MarketWatch also points out that some may be trapped by “rate lock” — enjoying the benefits of their ultra-low mortgage rates, and unwilling to spend more on financing costs. 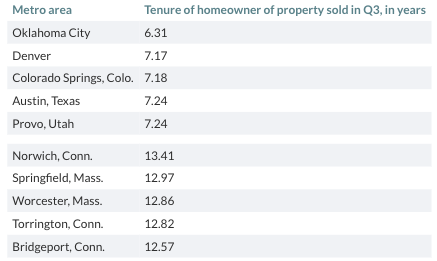 The top nine cities with the longest homeowner tenures are all in Connecticut or Massachusetts, and the next seven are in California. Oklahoma City, Denver, Colorado Springs, and Austin are cities with the lowest tenure. In a separate ATTOM report, annual home price appreciation slowed in 49% of local markets, including Los Angeles, Chicago, Dallas-Fort Worth, Houston, and Miami. 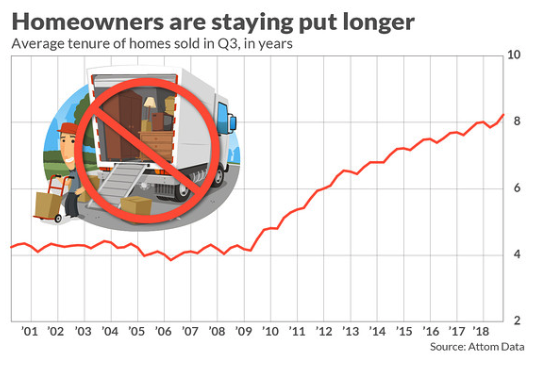 With the housing market peaked, Americans could soon find out that they will be trapped in their homes much longer than they ever expected, as the US economy is expected to enter a slowdown in the second half of 2019 or early 2020.